Als Hintergrund habe ich heute dunkelgrauen Cardstock verwendet. Darauf habe ich eine relativ große Menge Gesso verteilt, damit das weiß schön deckend ist. Dann habe ich mit dem Gesso noch einige weiße Klekse gespritzt. 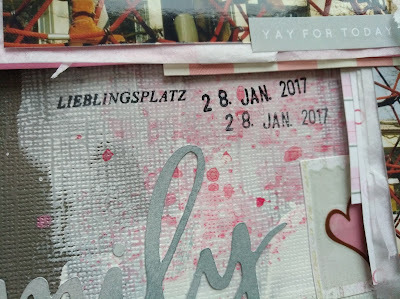 Nachdem alles getrocknet war, habe ich etwas pinker Sprühfarbe auf dem Gesso verteilt. 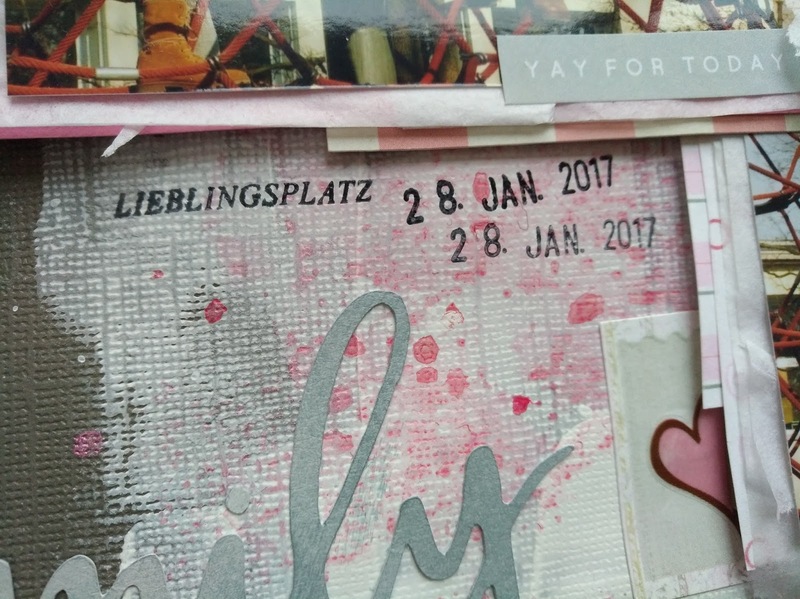 Die Fotos habe ich mit Resten aus rosa und grauem Papier hinterlegt. 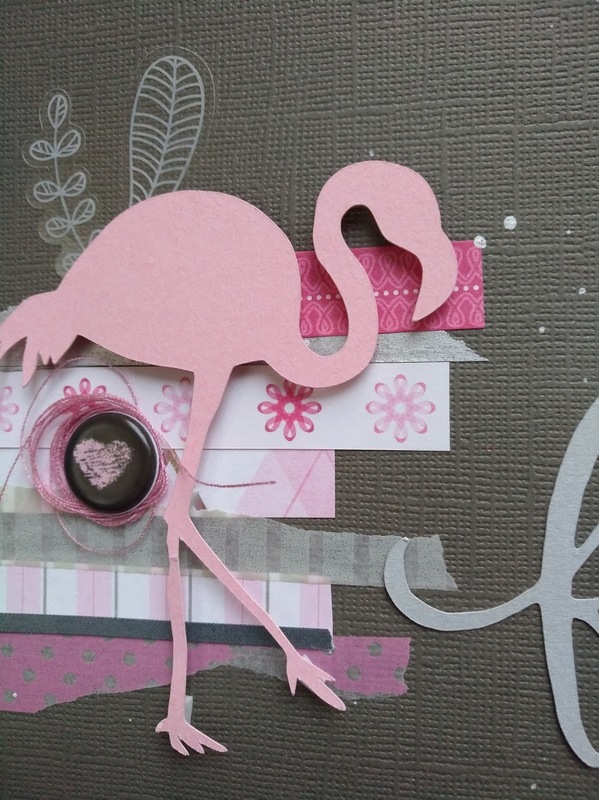 Hinter den Flamingo (Datei von the cut shoppe) habe ich noch einige Streifen Papier und washi-Tape geklebt. 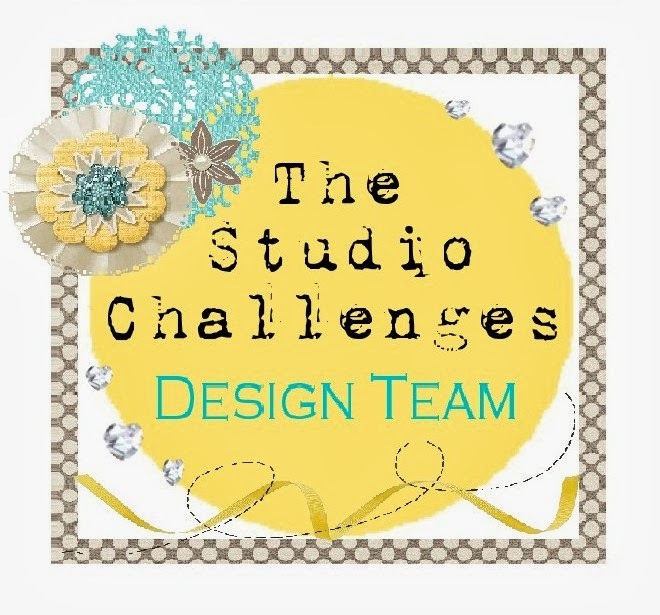 Today, I used dark grey cardstock as my background. Then I smudged lots of gesso on the cardstock and splattered some of the white gesso around. After drying, I sprayed some pink color spray onto the gesso. The photos are backed with scraps of pink and grey cardstock. Behind the flamingo (cut file from the cut shoppe), I sticked some paper strips and washi tape. Wonderful take on the sketch! I love the colors and the embellishments. Thank you for playing with us at Stuck?! Sketches. What a fabulous take on the sketch! 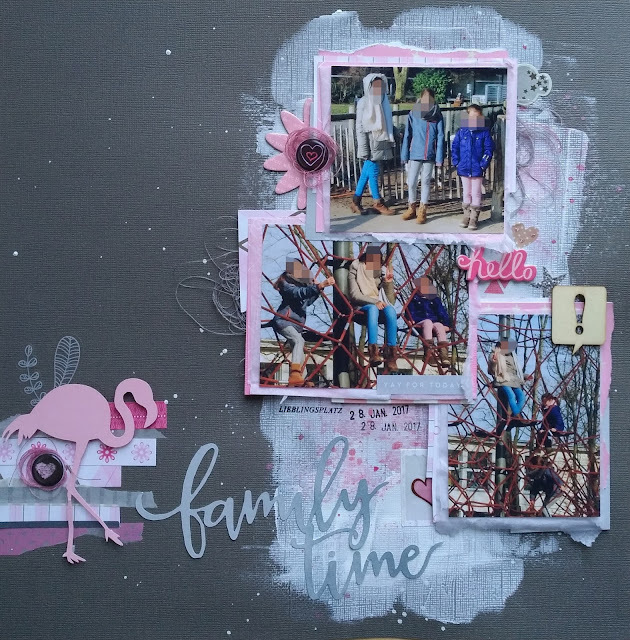 I love the texture on the back ground and that flamingo is so cute.. thanks for joining in with Stuck?! Sketches! Schöne Umsetzung, das rosa ist ein toller Kontrast zum dunkelgrauen Hintergrund. Danke fürs Mitmachen. Wow, this is so pretty!! I LOVE the mixed media behind the photos. Great job with the sketch! Great take on the moodboard! those colors are so lovely together and the flamingo is so cute!! Such a sweet layout. I love your background details and those little pops of pink. Love your background work and the cute flamingo. Wonderful layout! Thanks for joining us at Off The Rails! 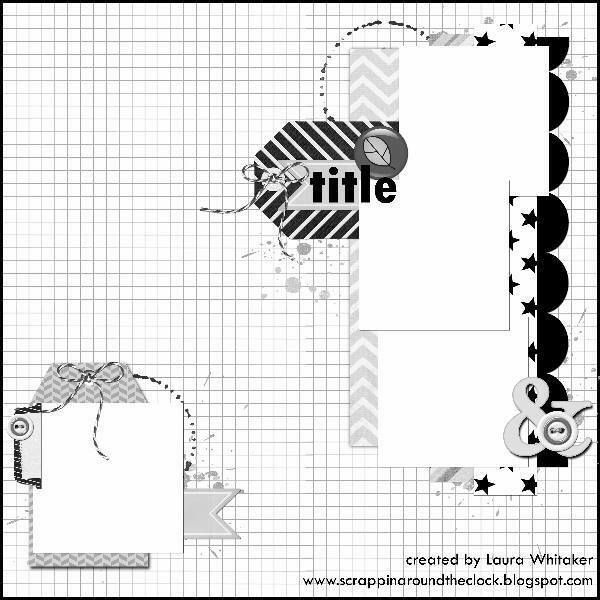 Such a pretty page, love the mixed media work on the grey background! Thank you for joining us at Stuck?! Sketches! Such a gorgeous page. 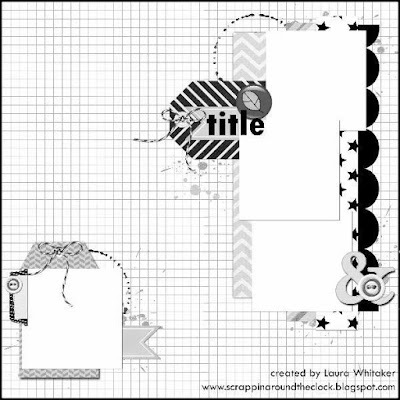 Thanks for playing along with Off The Rails Scrapbooking. Very pretty page. I love the details that you added. Thank you for joining us at Stuck Sketches. Great take on the mood board. Thanks for joining us at OTR! This is lovely, Denise! 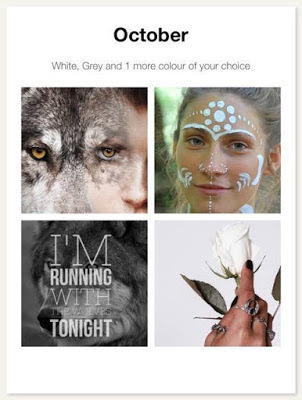 I love how you have interpreted our mood board over at OTR! Thank you so much for playing along with us!